MP: When I was growing up, there were toys that flew off the shelves during the holidays (Cabbage Patch Kids, for example). Is there a toy that’s popular this year? Similarly, are there any toy trends? Anita: Every year we attend American Specialty Toy Retailing Association (ASTRA) Marketplace and Academy, as well as the New York Toy Fair, to find the newest, hottest toys! The annual, ASTRA Best Toys for Kids list contains a great mix of new and classic toys, and we tend to carry almost all of those picks in our stores. This year, a few new customer favorites include Mermaid and Shark Tail Blankets, Scribble & Play Boogie Boards, and the X-7 Micro Drone, which can fly indoors or out. And of course, we always sell a lot of our classic top picks, including Doink-It Magnetic Darts; multi-activity tables for building blocks, LEGOs or trains; Stomp Rockets; LEGO sets; Brio Trains…. the list goes on and on! MP: My children are older now. At 9 and 10, I’m finding it more challenging to find them toys they’ll enjoy and appreciate, especially with the lure of electronic games. What do you suggest for this age group? Anita: We recognize that technology can be a useful, educational tool and that it can also be counter-active to the benefits of unplugged, imagination-fueled playtime. Usually around 9 or 10 is when kids really want an element of technology in their play. We recommend taking a look at our science kits to feed that part of their brains. We have some really cool robotic sets from Thames & Kosmos that will keep them engaged and hungry for more! Klutz kits are also a really great pick – they’re creative crafts that come with detailed instructions and all the materials kids need to learn a new skill; knitting, jewelry-making with Shrinky Dinks, comic book drawing, felting, and using a loom to make potholders. Klutz Kits are great for crafty kids. MP: Your shops carry so many beautiful toys for babies and toddlers. Are there any new items that you’re loving? Anita: The brightly-colored Spin Again stacking toy has been a huge hit. Ride-on toys like Tiny Rider tricycles are always great for balance and coordination. And Sophie the Giraffe is a must-have for infants. Fisher-Price toys are a nostalgic favorite this year, including the See ‘N Say! Spin Again stacking toy for little ones. MP: My family loves playing board games and card games during holiday break. Are there any popular new games or award winners? Anita: That’s awesome! We love playing games, too. Settlers of Catan is one of our favorite picks for ages 10+, and especially game-loving adults. We have a Harry Potter Clue game that has been a huge hit. Dragonwood, an adventure game, is another award-winning choice. Buggaloop is fun because it uses Hexbug Nanos, and Tenzi is a fast-playing dice game that makes our employees super competitive! MP: I’ve spotted local books and handmade items in your store. What other locally made items do you carry? 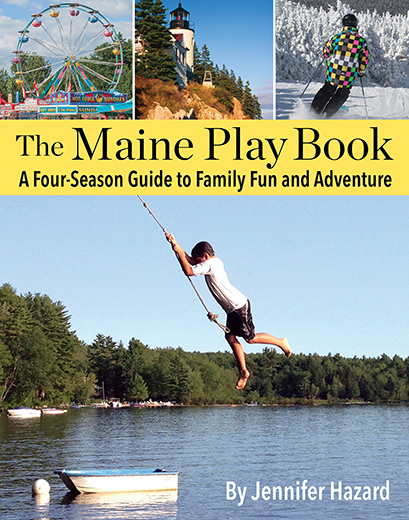 Anita: We carry a lot of books from Islandport Press, which is a local publishing company that features amazing Maine authors and illustrators. We are always open to carrying more Maine-made items and love customer suggestions! MP: Is there a classic, go-to toy, book or game that always sells each year? Anita: I think PlasmaCars and Doink-it Darts tend to be top sellers every year because of their versatility. PlasmaCars hold up to 220 lbs. so adults and kids can enjoy zooming around on them simply by wiggling the steering wheel back and forth. And Doink-it Darts are a safe, fun alternative to real darts that can be played by the whole family. PlasmaCars are fun for all ages. MP: My mother-in-law, a retired kindergarten teacher, is the queen of stocking stuffers. What do you suggest for someone who is looking for something fun or unique? Anita: If you want to be truly unique, puzzle them with Tantrix, a color-and-pattern-matching logic game. You could also give everyone in the family wind-up or pull-back toys and hold a race to see which crosses the finish line first. Or start a new tradition by giving kazoos for a family band. And you can always encourage reading with a clip-on book light. Some of our top picks for stocking stuffers also include LEGO mini-figures, Thinking Putty mini tins and MadLibs. Everybody loves MadLibs! MP: For those who are on a budget, are there durable, tried-and-true toys that are also available at a great price? Anita: YES! The great thing about coming into Island Treasure Toys is that our toy experts are here to listen to your needs and hand pick the perfect gifts to fit your list and your budget. We only carry toys of the highest quality, so even at lower price points, you can be assured that our toys are durable and will be played with more than once. Melissa & Doug is an example of a company we carry. They’ve made durable, imagination-powered toys, games, and crafts for over 25 years, and their products stand the test of time. Many thanks to Anita Demetropoulos for her thoughtful gifting advice! To learn more about Island Treasure Toys, including store hours, visit here.